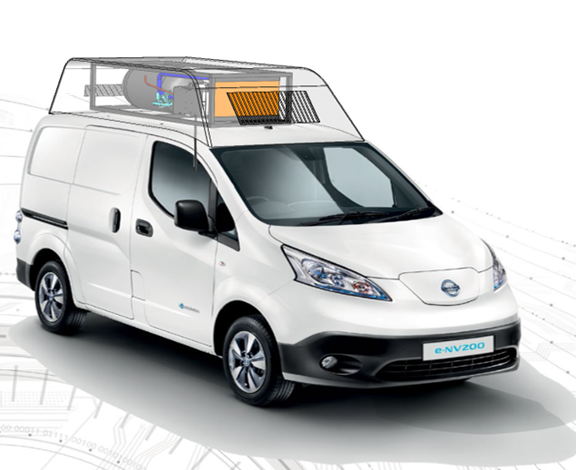 A roof-mounted hydrogen fuel cell can double the fully laden range of the Nissan e-NV200 van for last mile deliveries. ULEMCo plans to offer a zero emission fuel cell power module designed to work with one brand of electric van, extending the company’s portfolio of practical commercial vehicle products. The company has developed a fuel cell based unit that will extend vehicle range by supplying additional power to the standard Nissan e-NV200 van; particularly targeting the need from vehicle operators for improved utility of electric vehicles when fully loaded. With the combination of the on-board hydrogen storage and fuel cell module, the van will have a range of over 150 miles when laden, satisfying the range requirements of most average daily delivery operations for this size of van. ULEMCo’s power module has been specifically engineered to provide additional energy to the vehicle so that the operational practicality of the full electric vehicle can be widened to cope with seasonal range variation, working lifetime and the impact on range when fully loaded – all things that currently limit the range of duties an operator can target for existing for zero-emission commercial vehicles. Using a 12kW fuel cell and 1.6 kg/day on-board hydrogen storage capability, the van will have almost twice the range of the standard e-NV200, measured to NEDC standards, without sacrificing load space capacity. ULEMCo’s fuel cell RX power module will be roof mounted, and provide motive power via the battery to support the drive load requirements for the base van. This development is also important as the fuel cell electric vehicle (FCEV) is specifically targeted to be eligible under the recently announced Office for Low Emission Vehicles (OLEV) support scheme. The OLEV Hydrogen for Transport Programme was launched last week to provide up to £23m of new grant funding until 2020 to support the growth of hydrogen refuelling infrastructure, alongside the deployment of new vehicles via an open competition for both Hydrogen Refuelling Stations and hydrogen fuel cell vehicles.